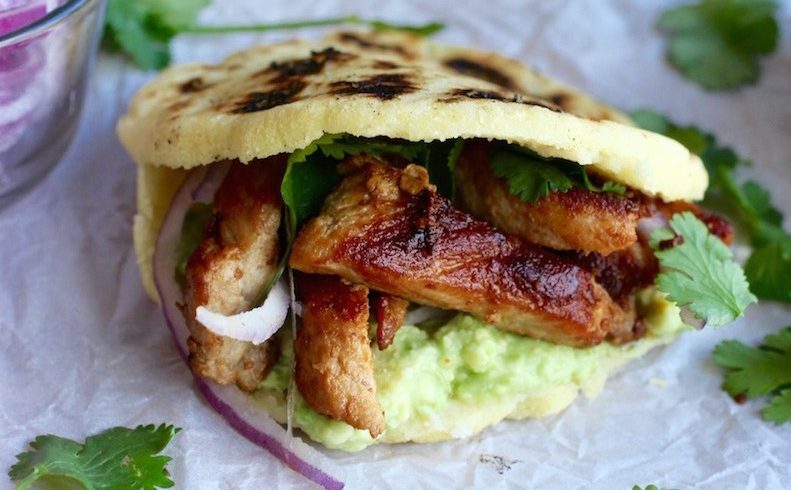 Newcomer Kitchen’s Weekly Pop-Ups are taking a breather. 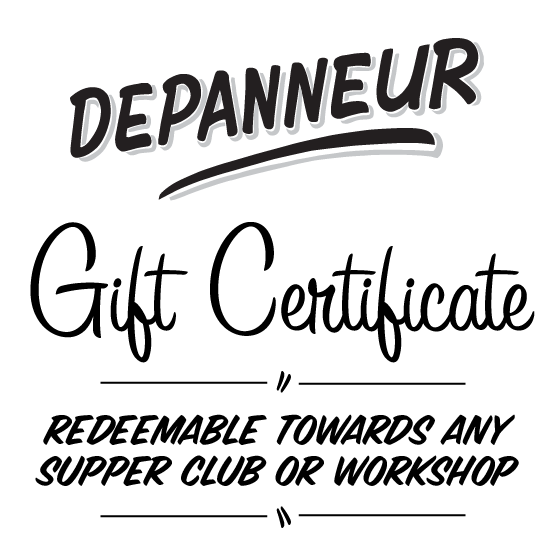 For nearly 3 years, The Depanneur and Newcomer Kitchen have worked together to bring a simple idea to life: that by opening our kitchens to newcomers, we can create unique social and economic opportunities. 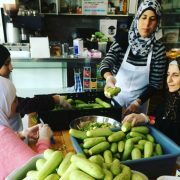 What started as small gesture of hospitality blossomed into an innovative new model of facilitated entrepreneurship that has worked with more than 80 Syrian families, and paid out over $150,000 directly to these amazing women. A combination of luck, hard work and incredible community support has seen the seed of this idea flourish beyond anything we might have hoped. 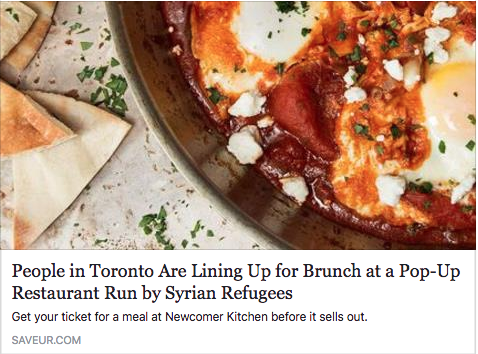 In this time we have accomplished so many amazing things: over 10,000 meals served, a pop-up brunch, a luxurious gala, community dinners, corporate workshops, restaurant takeovers, cooking classes, teaching in schools, participating in the Luminato Festival, Terroir Symposium, Hot Docs, a national ad campaign, and more, and more still. The food prepared by these remarkable women has been served to everyone from our neighbours to the Mayor to the Prime Minister, to CEOs, philanthropists, dignitaries and scholars. The project has been covered by the local, national and international press; there is even a feature-length documentary of it all, sitting awaiting funds for editing. Even more exciting plans lay on the horizon: a social-enterprise catering company, team-building workshops, new collaborations national and international — but these take time and energy to realize. 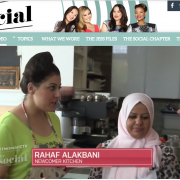 Since its inception, Newcomer Kitchen has grown exponentially in scope, impact and complexity. But beyond our own grassroots support, our modest fundraising capacity and the help of a few key corporate sponsors, we have — for a slew of complex reasons — not yet received the kind of core funding needed to sustain the current program. Newcomer Kitchen has generated dignified and equitable income for its participants, and managed to just cover its expenses, but it does not earn nearly enough to support the enormous administrative effort needed to run it as an organization. This may be in part because we have been so busy actually doing things, so compelled and constrained by financial precarity, that we have not had the capacity to do the big-picture strategic work needed to evolve. To fix this — to turn what started as a small, spontaneous act of welcome into a sustainable organization that can take this powerful, innovative idea out into the world — we need to regroup and refocus on the bigger picture. To do this, we need time, space and energy (and, of course, funding!). 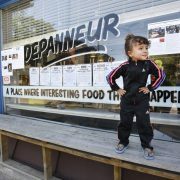 The time has come for the weekly pop-ups at The Depanneur — over 120 to date — to take a rest, and for us to redirect that time and energy towards mapping out a broader plan for the future. How can we bring this idea to more newcomers, in more communities? How do we measure the profound impact this project has had, and how do we package up what we have learned so that others might benefit from it? The work to answer these questions requires a stable source of funding, and this is what we hope to focus on in the coming months. Newcomer Kitchen continues to be an exciting, living prototype, a proof of concept that has been an incredible success by any measure. I know that it has touched the hearts of thousands of people, enriched the lives of an amazing group of newcomer women, and set a global example for what is possible. 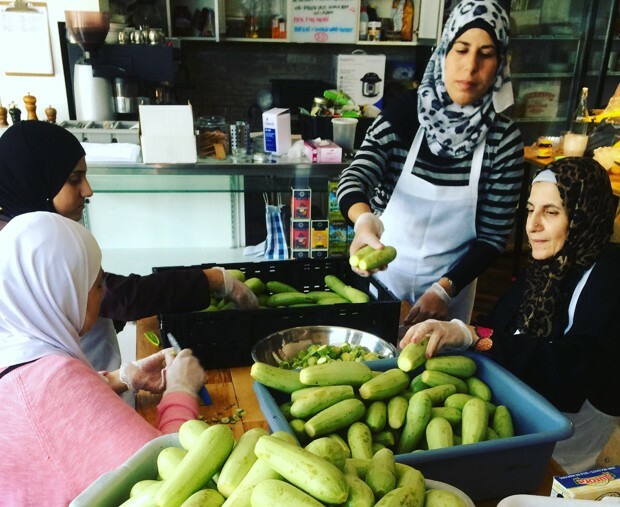 We will continue to work with and support the women of our Syrian community through our fledgling corporate catering and workshop programs, and we hope to make them a cornerstone of our future projects. Newcomer Kitchen has taken on a life of its own, one that needs to be nourished so that it can truly flourish and realize its potential. It has afforded us 3 amazing years and countless unforgettable experiences. But even as a caterpillar has to stop eating to become a butterfly, so we too need to pause for a moment to begin the transformation to the next phase of our beautiful little experiment in kindness and hospitality. 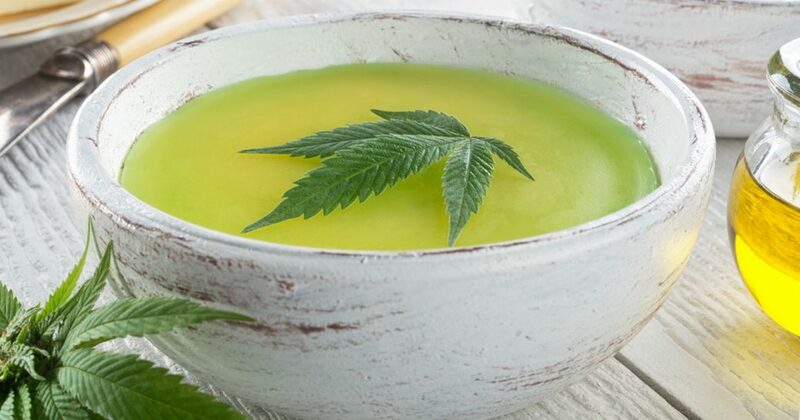 PS – We will continue to post updates on our project and progress in the coming months, on our website, Facebook group, and social media pages. If you wish, you can also sign up for our email newsletter, or reach out to info@newcomerkitchen.ca with specific inquiries. 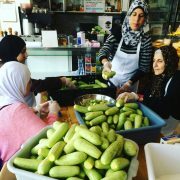 …No Syrian food businesses has felt the spotlight more acutely than Newcomer Kitchen, a nonprofit group of women who come together each Wednesday to cook a traditional Syrian meal in a small cafe and food business incubator called the Depanneur. Newcomer Kitchen began in March 2016 as a way of giving newly arrived Syrian refugees who were temporarily living in airport hotels a chance to cook a meal. But it has grown into a collective of 60 cooks, who rotate in groups of eight to make 50 three-course takeout dinners each week, for $20 apiece. The group has been the subject of dozens of news stories around the world, and a documentary film is in the works. 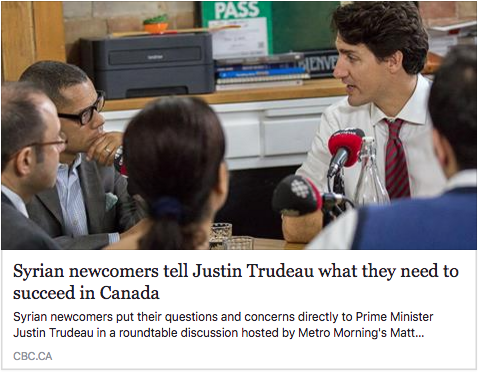 A year ago, Mr. Trudeau visited with the press in tow, and his smiling face is proudly displayed around the kitchen. Dyana Aljizawi had spent three days cooking more than two dozen traditional Syrian dishes — rice pilaf, hummus, salad, baba ganoush, roast chicken legs and more — and she was exhausted. It was a busy night for the 20-year-old refugee from Syria, who was the center of attention at a gathering of the Syria Supper Club, a group dedicated to welcoming refugees through meals. 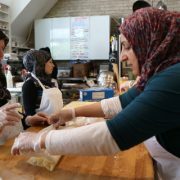 Aljizawi is one of many refugee women from Syria who have connected with their new homes and earned money by cooking and sharing traditional food with neighbors in the U.S. and Canada. 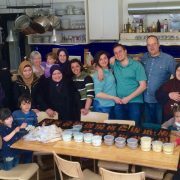 Through the Syria Supper Club, the women profit from making buffet-style dinners for the specific cause of pushing back against Islamophobia and xenophobia which they say was exacerbated by President Donald Trump’s election. 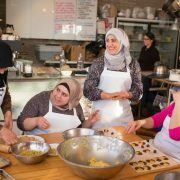 When Canada pledged to take 25,000 refugees fleeing war in the Middle East, one restaurateur in Toronto opened his doors, giving a group of Syrian women the opportunity to cook for the community, spread the wealth of their home country’s cuisines – and find new purpose in a strange city. The hottest new brunch in Toronto doesn’t come from a Michelin-starred restaurant, and it doesn’t feature a trendy pastry mashup. 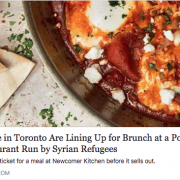 It’s a pop-up staffed by Syrian refugees. When Senater heard about the growing refugee population in Toronto, his first thought was about their kitchens. How could they cook for themselves, he wondered, if they were staying in hotels for weeks or months? Senater, who founded event and kitchen space The Depanneur, thought that he could give them access to a kitchen so they could cook for themselves and their families. “We invited these ladies, and they cooked this amazing food,” he said. 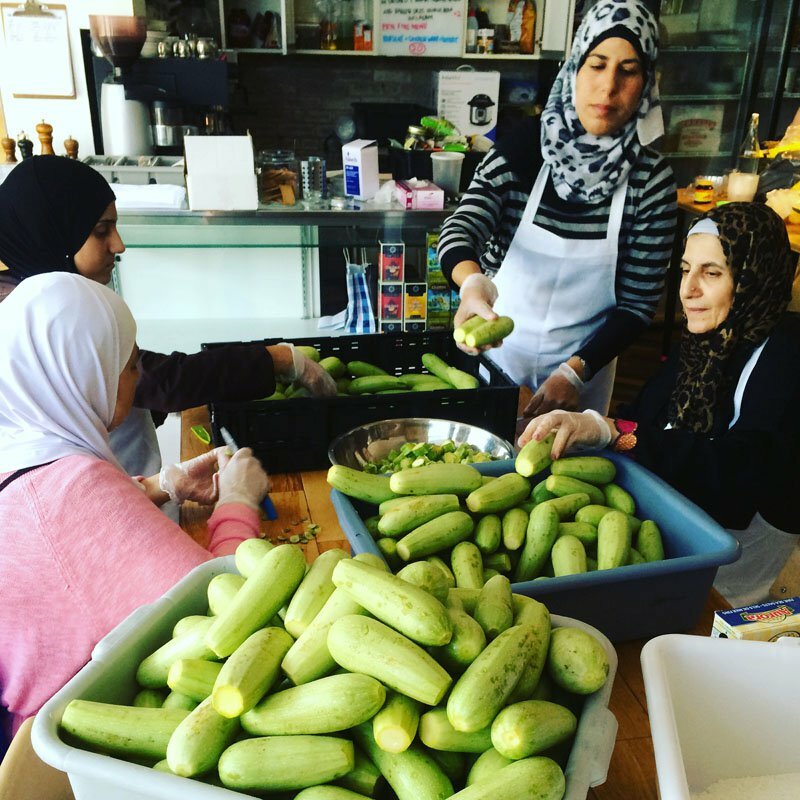 For the one-year anniversary of the Syrian settlement, CBC Toronto’s Metro Morning gathered a group of newcomers as well as sponsors to reflect on the past year and discuss the road ahead in the heart of the Newcomer Kitchen. 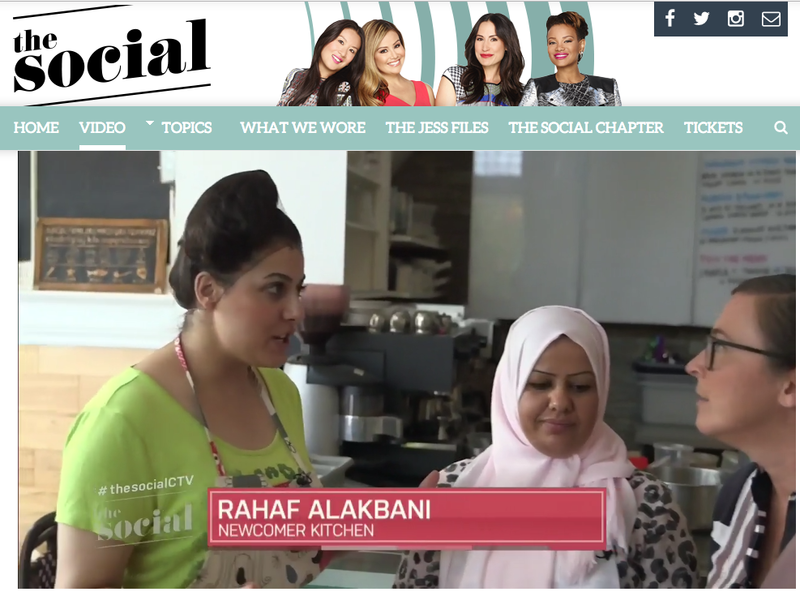 Jessica Allen visits Newcomer Kitchen for CTV’s The Social. The dessert prepped, six women crowd around a map, showing each other where home was before war ravaged Syria. Len Senater is used to inviting strangers into his kitchen. 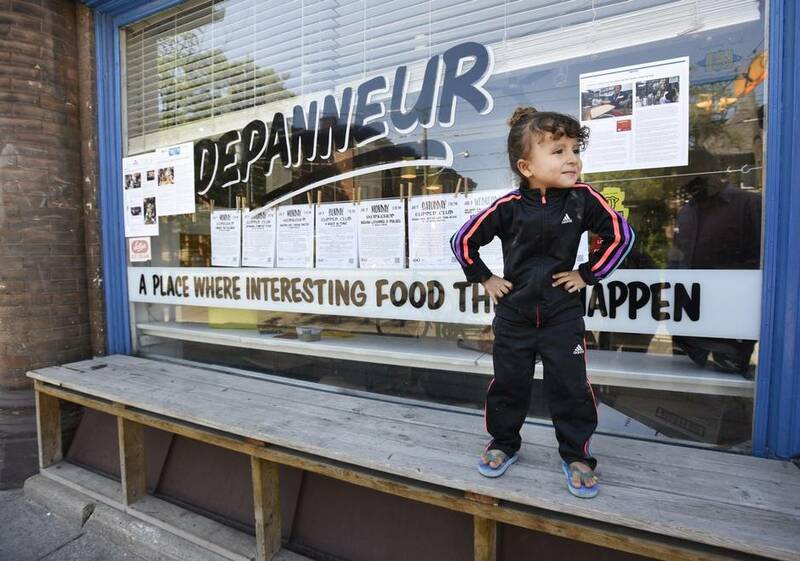 It’s the business model of The Depanneur, Senater’s eatery and community hub housed in an old convenience store just west of Toronto’s downtown. For five years he’s been inviting strangers to come, make their favorite food, and sell it to the community. It’s so hot that the door to The Depanneur restaurant is propped open for air circulation. The smell of frying onions and then stewed chicken wafts outside into the steamy Toronto afternoon. 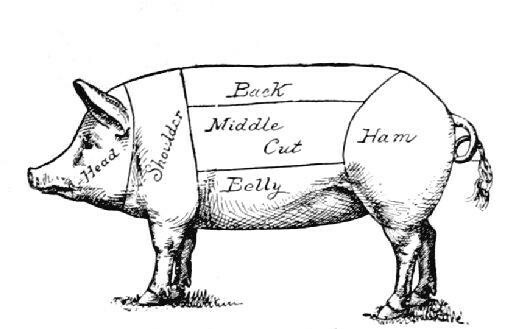 It’s hard not to stop and peer at what’s going on inside the crowded open kitchen in the back. 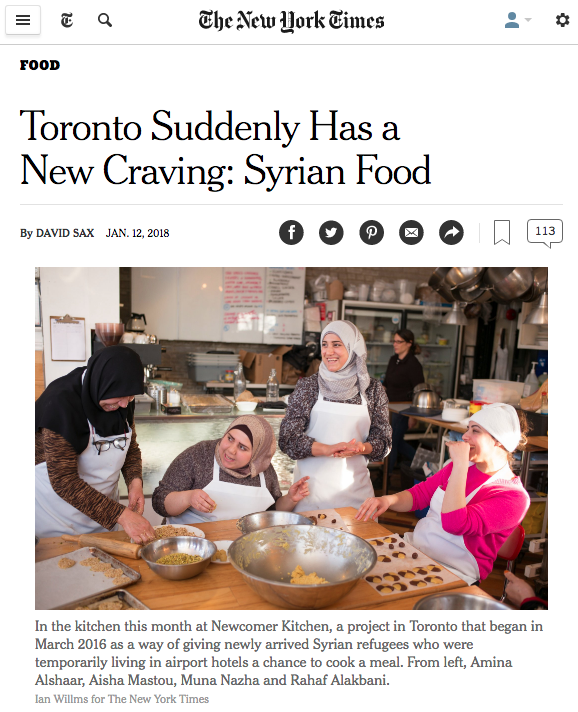 About a dozen women — some wearing headscarves, others in jeans — are busy cooking a three-course meal. But none are staff; they’re Syrian refugees who have been in their new home of Canada for just three months. Sinaa Fakhereddin does not like eggs. She makes that clear to a kitchen full of strangers when she is asked to add an egg to the pot on the stove. Never in her life has she made sauce with eggs and she’s not about to start now. The other women are tense, not willing to argue with a 67-year-old woman who has seen more and done more than any of them. “Mom, just add the egg. It doesn’t matter,” mutters 27-year-old Muhammed Aboura, laughing. Ms. Fakhereddin arrived in Toronto just a week ago to join her son, who has been here a year. 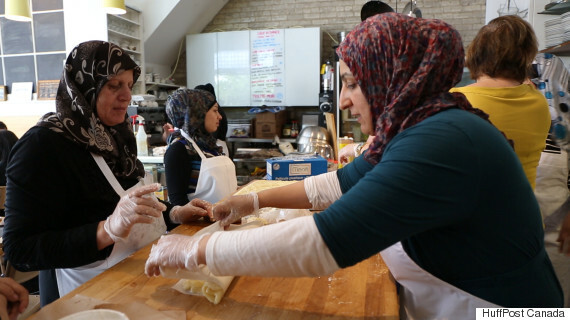 The two are Syrian refugees sponsored by members of the United Church of Canada, and they are keenly aware that they haven’t gone through the hardships that many others in the kitchen have, most of whom are on government assistance. Mr. Aboura is just relieved to have his mother here, safe and protected from the Syrian regime. “I got to eat my mother’s cooking for the first time in three years last week. I couldn’t stop crying,” he says. He watches her carefully, ready to jump in and help communicate if necessary. 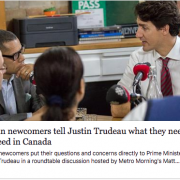 He spent time researching how to help newly arrived women adjust to life in Canada, and it led him to the Newcomer Kitchen.